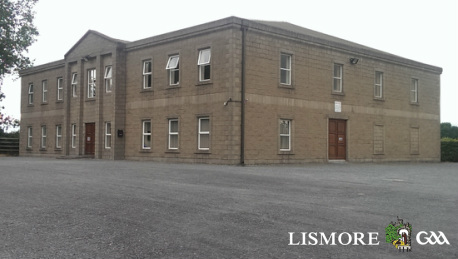 Lismore GAA Club was founded in the Christian Brothers School in 1897 with Sean Goulding (later to become a TD) as Chairman, Jack Bennett as treasurer and a Mr Creedon as secretary. Thanks to a Mr Vin O’Brien, the original pitch was located outside town on Mayfield Rd. The club’s main interest at the time was football and the team played as the Blackwater Ramblers. The Ramblers had major success when they won four senior football county finals in a row in 1899, 1900, 1901 and 1902. This was followed by two more senior county titles in 1908 and 1911. In 1911 the club won the junior title with their second string team Ballyin Rovers. In 1905 the hand ball alley was built by James Campion and has withstood the times. Although after some attempts to form a hurling team in the 1900’s it wasn’t until the 1920’s that Lismore commenced its hurling tradition. By this time the field was located in Ballyin where the golf course now is. In October 1924 Lismore won their first hurling trophy when they won the county junior hurling final and this was followed up with the first senior championship title the following year in 1925. The club had further successes at Junior and Minor levels throughout the 20’s and 30’s. After the junior county final wins in 1938 and 1940 this was followed up by the seniors winning the senior county title in 1942 only to loose on an objection. After this, throughout the 40’s and 50’s the club competed at all levels without any success. The most noticeable feature at this time was the official opening of the current field in 1947. Thanks to the work at school level, Lismore CBS won the Rice Cup in 1959 and reached the final again in 1960 and 1964. These groups of players formed the backbone of the Lismore CBS team that won the Dr Kinnane Cup in 1965. This success bore fruition when in 1967 when the club was crowned U21 and Junior county champions. This was followed by victory in the Intermediate county title in 1969. As a result of this win the club was promoted to senior status a title it has held onto to date. Apart from winning the Sargent Cup (1st of 2 wins) and the Keaneland Cup in the mid 70’s the club didn’t have any great success. However this period and in the 80’s sterling work was done at underage level which is carried on today under the juvenile club. As a result of this work the club was successful in winning the U14 county title in 1981. This was followed up in 1983 when the U16 county title was won. With respect to the Senior title the club had to wait until 1991 to win its second title and this was followed up by a third title in 1993. Since then through many heart ache the senior title has eluded the club. However at underage levels the club had many successes throughout the 80’s 90’s and up to the present day winning many county titles at all age groups. The most outstanding achievement has to be the minors claiming the western title 10 years in a row from 87 to 96. It is only through the hard work and diligence at underage level will the CLG Lios Mór continue to prosper and evolve to meet the new challenges of the future to come. The idea of a purpose built Community Centre first came to light in the mid 1980’s and the then committee got involved in the GAA Clubs Development Co-Op draw. The proceeds from this venture were put towards the initial construction of the centre. Lismore Estates provided the location for the centre at the top of Gallow’s Hill and site clearance commenced in 1989. The steel structures went up in mid 1990 which also saw the completion of the blockwork and the roof. The building and construction of the centre under the then chairmanship of Michael Quann was all achieved without the need for any borrowings, which was a fantastic achievement and a great reflection on the hard working committee and the generosity of local support through the purchase of Super Draw tickets and National Lottery Funding through grant aided projects. Downstairs, the main hall has seating capacity for 450 and has varied uses. There is also a meeting room along with mens shower facilities. Upstairs we now have Gym facilities and Spinning Bikes along with a Sauna and Ladies Showers. The centre is well used by the Community at large with our players availing of Gym facilities for core training in the winter months and early season. Adjoining the Centre car park, there are two hard tennis courts again thanks to funding from the Co. Manager and the National Lottery which continues to compliment the other facilities and sports on offer. It is with great pride that I write these words of introduction for our Strategic Development Plan for 2014 – 2018 of CLG Lios Mór. Thanks to the steering committee and especially the sub committees, this plan is both practical and achievable and will benefit the community while developing the club in the right direction for the future. Over the next 5 years, we hope that CLG Lios Mór will continue to progress and evolve as an organsation. Given the current economic climate, with its obstacles such as emigration and financial constraints, it is my belief that this plan will aid our club in overcoming these obstacles and ensure a bright and successful future of the club and members. This plan can only be successfully implemented with the dedicated hard work of the committee and the support of our members and the community. Finally when this 5 year plan is achieved in 2018, CLG Lios Mór will be on a secure path leading into the future for the next generations.